The company Crossbar announced it will start producing the first prototypes of restive memory, also know as RRAM. While we just reported about Samsung mass producing 3D NAND with nearly the same benefits. RRAM should also be faster and more reliable than traditional NAND flash memory while allowing to store more data per chip. RRAM cells are based on a switching material with different resistance characteristics sandwiched by two metallic electrodes. The switching effect of RRAM is based on the motion of ions under the influence of an electric field or heat, and the ability of the switching material to store the ion distribution, which in turn causes a measurable change of the device resistance. The first chips are now manufactured at a commercial chip fab which the company calls a major milestone of the new memory technology. According to Crossbar their memory can be compared to NAND memory but uses only half the size of a chip for the same capacity. Ny stacking layers in 3D the techonology should be able to deliver capacity of several terabytes per chip. The company claims it can store 1 TB of data on a 200 square milimeter chip. RRAM is targeted for use in SSDs, tablets and other mobile devices. RRAM should not only make it possible to achieve higher data density but should also consume less power than traditional NAND memory. 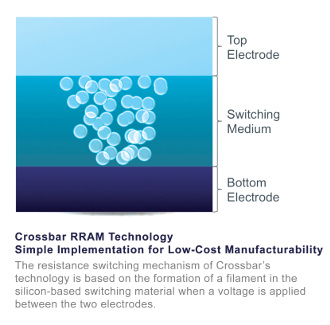 Crossbar claims that their RRAM is 20 times more power efficient than NAND. Also performance and reliability wise it should be a large improvement, Crossbar claims their RRAM will be 20 times faster than NAND and 10x more reliable. By producing the memory using a standardized CMOS method it should be possible to relatively soon become commercial viable. How RRAM compares to Samsung’s 3D NAND is unfortunately unknown.